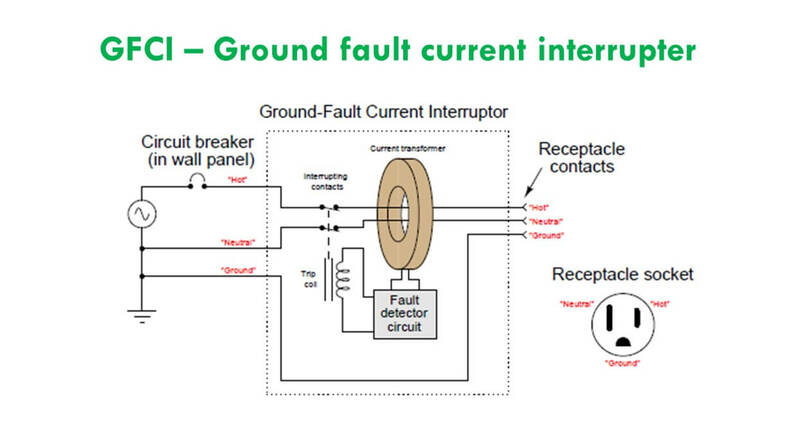 GFCI or ground fault current interruption is a differential current protection scheme which works by comparing the difference of current between hot and neutral conductors that carry current from and to the load plugged in the receptacle. A device intended for the protection of personnel that functions to de-energize a circuit or portion thereof within an established period of time when a current to ground exceeds the values established for a Class A device. A GFCI Receptacle contains a single current transformer which surrounds hot and neutral conductors and then compares the magnetic field around both conductors. Under ordinary conditions (no fault) both currents are equal and the magnetic fields are canceled and zero net fields are observed by the CT. In case of a fault, the overall currents are unequal and CT detects a magnetic field. The figure below displays block diagram of GFCI installed on a system. GFCI is a highly sensitive device which detects a very small amount of current (mA) and trips. Usually, the face of GFCI has a reset and a test button. The test button is used to manually test the working. Whereas the reset button is used to reset the GFCI after a successful trip operation. NEC 680.22 code suggests that all 15- and 20- ampere single phase 125-volt receptacles within 6.0 m (20 ft) of the inside walls of the pool should be protected with a GFCI. The video tutorial below involves special technical skills. You should not perform electrical installation until you are sure. In no case shall the author, developer, or contributors be liable for any sort of damage which arises while using or acting on the content provided on our website. Home-Improvements shares the practical guide to install a GFCI receptacle.